Currently, only one retail Surf City Coffee Company coffee store in Scotts Valley. Our store is located right by the freeway onramp/offramp on Mount Hermon Road. Our warehouse and roasting facility is located in the city of Soquel. Quality products have always been a top concern. During our formative years we outsourced our coffee offerings from well-established roasters. We felt we needed to better control our coffee quality, so we purchased our first Diedrich roaster and brought-in the best Roast Master we could find. The rest is now history. We have the experience the equipment and the know-how to roast only the finest arabica coffees available. You will never find another piece of grandma’s pie; you can search and search, but it will never be the same, even if you have the recipe! Grandma only made one or two pies at a time. It was her close attention and that sprinkle of love that created that unforgettable flavor. The same is true with coffee. Our Roast Masters are hands-on, dedicated roaster’s with years of experience roasting only in small batches. That’s why our customers always come back! It is with this love and dedication that we operate our business. Surf City Coffee Company is employee owned. We all have a vested interest to ensure that our coffee is the best available. Our commitment to customer service is unsurpassed. 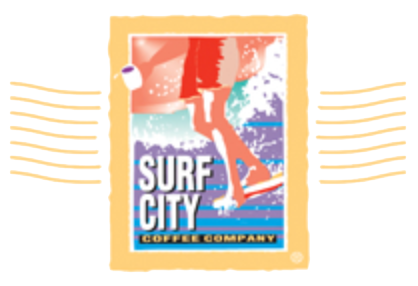 If you are ever dissatisfied with a Surf City Coffee Company coffee product for any reason, please return it to us for a refund or replacement. Surf City Coffee Co. is a USDA certified organic coffee roaster licensed by the California Department of Food and Agriculture and by the California Certified Organic Farmers Association (CCOF). We take pride in providing the best coffee that we can offer while helping to ensure that we care for Mother Earth. While chemicals are used to decaffeinate most coffee, Surf City Coffee is decaffinated using the SWISS WATER® Process which uses only water. It’s a patented process that results in great tasting coffee that is never subjected to chemicals.